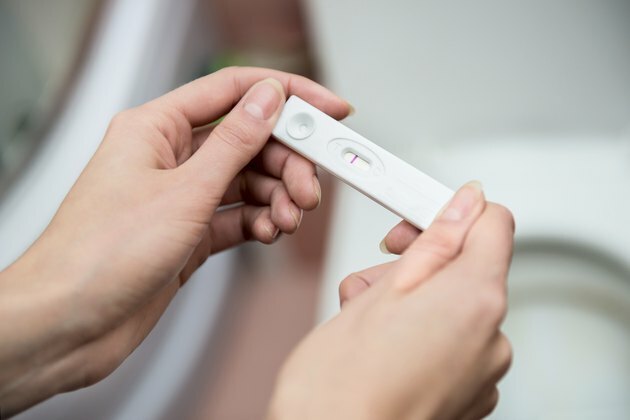 Positive pregnancy tests don’t always indicate that conception has occurred. In some instances, false positives occur completely unrelated to pregnancy. Several medical conditions can cause the production of human chorionic gonadotropin, or HCG -- the hormone which usually indicates that conception has occurred. Although very low quantities of HCG are present in some cases, the advanced technology of home pregnancy tests allows for detection of HCG at lower levels. False positives can be caused by fertility drugs, cysts, pituitary disorders and some cancers. Women undergoing fertility treatments, especially to stimulate ovulation, may be prescribed medications such as Pregnyl and Humegon. These medications include a form of HCG which can remain in the body for days after treatment. Women receiving these treatments should follow their doctor’s instructions to not test too early, to avoid getting a false positive. Choriocarcinoma is a type of cancer which occurs inside the uterus. Cancerous cells produce HCG which is detected as a pregnancy. Symptoms of choriocarcinoma include vaginal bleeding, pain and ovarian cysts. Treatment involves chemotherapy, followed by close observation for the next three years to detect possible recurrence. Disorders of the pituitary gland can cause a false positive pregnancy test. Pituitary tumors can stimulate cells in the pituitary gland to produce HCG. Menopause can also affect the pituitary, leading to HCG production and false positive pregnancy tests. On rare occasions, the pituitary can create HCG even when no disorder or tumor is present. Corpus luteum cysts on the ovaries can cause false positives on pregnancy tests. The corpus luteum remains on the ovary after the egg is released. With time, it disintegrates and the cycle is repeated. If the corpus luteum fills with blood or fluid, it becomes a cyst and remains on the ovary. The corpus luteum produces HCG, and can therefore interfere with the accuracy of a pregnancy test. Some types of cancer including bladder and ovarian cancer may cause a false positive to occur on a pregnancy test. These cancers can create small amounts of HCG which may be detected on highly sensitive home pregnancy tests. What Causes HCG Levels to Fluctuate? What Does a High hCG Indicate?